Stevia- What can you do with it??!!! About 2 years ago, I answered a request in a local gmail group to help someone with a project. The project entailed a grow – op, and had us meeting a complete stranger in the Wal-Mart parking lot to pick up some plants. Now that I have your attention, the plants we picked up were Stevia seedlings. And the “clandestine” transaction took place at 2 o’clock in the afternoon under the blazing summer sun within, sight of parking lot security could not have been less interested in whatever plants we were trading. So, about the seedlings… they were TINY (yes, “tiny” in caps could be considered an oxymoron)! Having barely passed the 2 leaf stage, there must have been 30 of those little guys all clumped together in a couple of tiny seedling trays – you know the ones I mean, sort of like ice cube trays, except for plants – all hoping for a great new home in their own pot. They were so tiny, the instruction video (which I was required to watch prior to picking them up), included a gardener lovingly swishing the little plants thru water in order to gently separate their roots. I can promise you the gardener in the video had more patience for this type of thing than I did, but I did manage to successfully transplant only 6 of the little guys, 3 of which succumbed to my poor gardening skills within the first month of being transplanted. Sigh. I kept the three survivors in filtered sunlight for the first year of their little lives hoping for some sign of strength in the plant, and living in fear that the person who had entrusted these little guys to my care would call for them back. A year later, those little guys still had not died, but they weren’t thriving either. They looked too delicate for full sun, but out of desperation, I moved them to a much sunnier (and HOTTER) location. Soon I had 3 much happier plants which very shortly needed transplanting to larger pots. 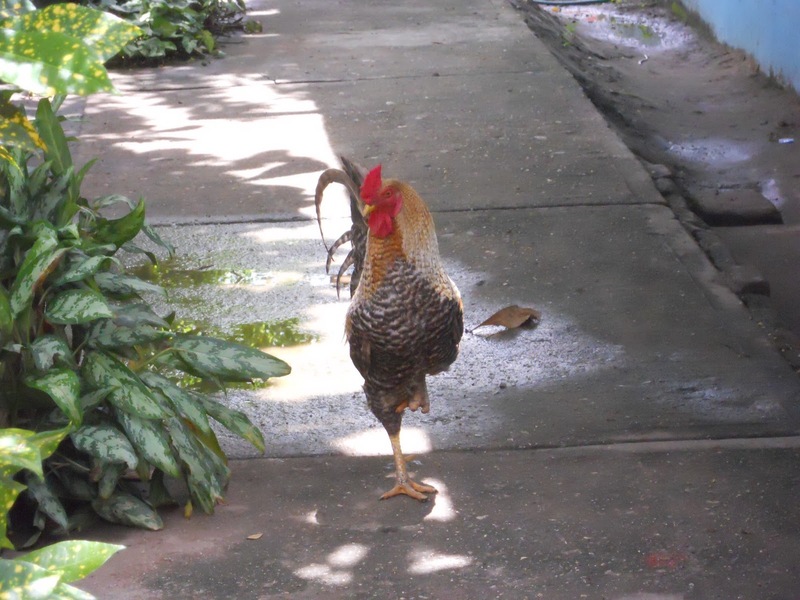 Turns out, they LOVE full sun during the Puerto Vallarta winters but need to be babied a little in the heat of our summers. It seems that Stevia will never be the full bodied beauty I had imagined it would be. It is straggly, unruly and never quite behaves the way I want it to. Much like my hair, only on good days, the stevia is greener than my hair. As I said earlier, we were offered these plants as part of an “experiment” but after all this time, we have never learned what that experiment was, but the plants continue to thrive in their pots by our pool. The sweetness of the leaves when eaten right off the plant has become a topic of fascination and conversation amongst us and our guests, and more often than not, I am asked how I use this plant. Until a couple of weeks ago, I didn’t have an answer for that, which, as you can imagine made me crazy. So, I finally decided to see just what I can do with our plants. Naturally, I turned to Pinterest for ideas and I was not disappointed! So many entries, I chose to try making my own Stevia Extract. … pack a jar full of stevia leaves, add vodka, wait a couple of days, heat (to remove the alcohol), strain and enjoy. Being too cheap to use the “good vodka”, on an experiment, I opted for a much cheaper brand, “Salamander”, with which to conduct this experiment. Figuring that the alcohol was just an agent to extract the sweetness from the stevia, I concluded that the flavour of the vodka before being added to the leaves would be unimportant. The results of the “Salamander” vodka experiment, while sweet, had a very strong and rather unpleasant aftertaste, much like the vodka itself. If you go this route, heed this warning and use a decent vodka. Mine was barely palatable mixed with tea or coffee. In a glass of limonada, it was more bearable because the lime juice somewhat masked its taste. In spite of the aftertaste, I considered trying this in baking, as a sugar substitute. Alas, it is a liquid, and I was not able to translate that to a sugar substitute in baked goods. Still unwilling to give up on finding a purpose for this plant, (and trying to avoid potentially wasting 2 cups of “the good vodka”), I grabbed some leaves yesterday, stuffed them in a jar and poured boiling water over them. After about 4 hours I had a wonderfully sweet “tea”. I left the whole thing in the fridge overnight to extract maximum flavour from the leaves and then strained the leaves out and wow, what flavour! Still a tiny aftertaste, but not too bad. For those of you who use artificial sweeteners already, you won’t even notice it. For me, the answer to the question “what do I do with it” became crystal clear – use it to sweeten tea! It can’t be more simple. Our guests this coming winter will be encouraged to add the fresh leaves to whatever tea they are brewing. How many Stevia leaves will depend on personal tastes. Because summer is on its way, I had to try some Sun Tea, which turned out rather well. The recipe is below, if you want to try this at home. Stevie Sun Tea – 4 cups water, 2 tea bags – any kind you like, Roiboos, Red, Green, or Black, 1 large handful stevia leaves. Put everything in a glass pitcher or jar, and set in the sun for a few hours. Once the water has darkened, strain out the stevia and the tea bags, pour over ice and enjoy a refreshing, sweet, sugar -free, therefore guilt-free glass of goodness. Author Heather WoodPosted on May 9, 2016 May 10, 2016 Categories BlogTags Casa Madera, Drinks, Iced Tea, Stevia, Stevia Extract, Stevia side effects, Summer Drinks, Sun Tea, TeaLeave a comment on Stevia- What can you do with it??!!! There is a song they sing about the city of Guadalajara, and included in the lyrics is hermosa. That means beautiful. And it is. Our first trip here was with our Mexican friends. Back then, we hardly had the confidence to leave the tourist areas in PV. I cannot begin to describe how far out of our comfort zone our first trip to Guadalajara was! Adding to our trepidation, was their announcement that we would be leaving on the midnight bus! After a restless night on the bus, we arrived at the Zapopan bus station around 5am, and finally, at the family home of one of our friends. In spite of the early hour, we were warmly welcomed by the entire family, even though we most likely looked like we had just rolled out of a ditch and they could not understand a word we said. Our command of Spanish back then was less than poor, and we spent a lot of time sitting in their living room understanding nothing but our names, which seemed to be bandied about frequently. In spite of the language difficulty, our hosts eagerly toured us through as much of the city and surrounding area as we could handle in 3 short days. It was a weekend all of us will remember fondly for many years to come. Now, 5 years later, our Spanish is a bit better; at least we can make ourselves understood, which also makes us better at translating street signs on the fly. We have visited this great city several times since our first visit and have learned that the major streets in Guadalajara are fairly easy to navigate, but they are as busy as any other major city, and they come with their own set of rules and etiquette. Coming from Edmonton, Alberta, population about 900,000 last time I checked, driving thru Guadalajara with its population of about 5million, we never cease to be amazed by the traffic here. Kevin has figured most of the major streets in Guadalajara and where they will take us. Aside from a little difficulty navigating around the construction for line 3 of the underground train system this trip, he got us to all our destinations with very few wrong turns. As always, the underlying reason for our trip was to visit the markets. Its not like we actually NEED anything, but we both love to wander thru the stalls looking for something that might strike our fancy. Our favourite and most frequented stop is the Tonola Market. Thursdays and Sundays, a normally busy street becomes insane when vendors set up their tables and tarps to display everything from curtains to ceramics to wood work, pictures, artwork, furniture, lamps, cushions, name it, you can probably find it at the market. Adding to the confusion, hawkers walk thru the narrow alleys selling everything from cold drinks to washing machine covers. Whether we buy anything or not, we always see something new and enjoy the time we spend there. Incidentally, all of the furnishings for our guest rooms came from this amazing place. Kevin, navigator extraodinarre, has also taken time to figure out the subway lines. From the Hotel Portobello, our home base for this visit, it was a 7 peso, 10 minute, subway ride to the Mercado San Juan de Dios. At least one full city block, and 3 stories high, its immenseness is awesome. Restaurants and electronics & accessories on the top floor, general goods, including clothing, saddles and leatherwork on the second and food on the bottom. Meat vendor after meat vendor eventually gives way to cheese and dairy, dried beans and finally, fruit vendors towards the exits. In between all that, stands selling Mexican Tortas large enough to feed a family of 4. If not for Kevins funky wheat allergy, … There are a lot of repeat stalls, and regular visitors all have their favourite vendors. My favourite vendor was the guy who sold me an new iPad mini cover for $160 pesos! This place is amazing and surprisingly, does not duplicate the Tonala Market. Our final market was one we had only recently heard of and our understanding was that it sold nothing but FOOD!!!!! Count me in, I couldn’t wait to see it. We a bit of difficulty getting around the subway construction, but when we finally laid eyes on the Mercado de Abastos, our jaws dropped. Covering a minimum of 5 streets, it never seemed to quit. Here, we found onions for 8 pesos a kilo, tomatoes (yes, good ones) for 7 pesos, sweet corn! (who cares how much that cost, we rarely see it! ), fennel, avocados for 16…oh, the list goes on and on, as far as your imagination can take you! Some prices were so low we could hardly believe them, and others were similar to here. If not for the 5 hour unrefrigerated drive ahead of us, I would have filled the back of the truck so fast it would have made Kevin’s head spin. Aside from the low prices, it seemed everyone in Guadalajara was in there! We had to gawk on the fly because of the river of people pushing us ever deeper into the market. Get to the end, change sides and the river pushes us out again. We highly recommend this stop, if only to have a good look at what organized chaos looks like from the outside. The vendors never seem to stop moving, weighing this, bagging that, next customer. It is one of the busiest places we have ever seen. Across the street, behind the parking lot, which is very civilized when one considers all the confusion of the market, there is a sugar store. And a bean store. And a seed store selling everything from Amaranth to Quinoa, including Turin Chocolate in large chunks suitable for baking. Take a number, because they are so busy, they don’t have time to look at you until it is your turn. Oddly, amongst all that food, we could locate only 1 stall selling prepared foods. Their speciality was Tacos de Cabeza, which includes but is not limited to beef tongue, cheeks, lips and brains. Already reeling from the sensory overload of the market, we opted to look for our breakfast in a quieter local. If you are like Kevin and I, we don’t eat as much fried food as we used to. But our love of fried foods still dwells within us! The big difference being, that now, if we are eating something fried, it had better be good! No longer do we settle for mediocre fast food fare to satisfy our cravings (though I will admit to a weakness for the onion rings at Carls Junior lately). Mostly when we want something fried, we want the best darn fried food we can find, and for food snobs like us, that usually means making it at home. Enter Bon Appetit magazine and their recipe for southern-style fried chicken. Originally published in 2012, I only discovered this recipe last year. (Go ahead and make fun. Food nerds like us are thrilled to have back issues that we can read at our leisure as many times as we like.) The recipe actually calls for the chicken to be fried in oil stove top, so I balked at trying it for a long time. Both Kevin and I, being career insurance people, know very well just how dangerous a pot of hot oil on the stove can be. However, their claim that this is “the only Fried Chicken recipe we will ever need” had us searching for a good deep fryer at every store we entered for the next 6 months. This is not Canada, and while they are easy to find now, 3 years ago when we started looking, it was like hunting for hens teeth. We eventually convinced ourselves that we live in a concrete house, with marble counters and finally, we talked ourselves into making this without a deep fryer!! We should have videoed our first attempt, as I am sure all the precautions and worry we took were worth a sit com series but in the end, the finished product was well worth the effort and worry! Juicy inside with a crispy crust, and the hot vinegar pulls it all together. You will need to start the vinegar a week in advance, and the chicken does have to sit overnight, so there is some planning inovolved, but I promise you it will be worth it! We are used to doing it stove top now, and are happy with the results but if you prefer using a deep fryer, just be sure that your oil is at the magical 350F before adding the chicken. I am sure you will get the same results. The real key to this is to use a smaller chicken and to let it sit in the dry brine over night. Whisk 1 Tbsp. salt, 2 tsp. black pepper, paprika, cayenne, garlic powder, and onion powder in a small bowl. Season chicken with spices. Place chicken in a medium bowl, cover, and chill overnight. Let chicken stand covered at room temperature for 1 hour. Whisk buttermilk, egg, and 1/2 cup water in a medium bowl. Whisk flour, cornstarch, remaining 1 Tbsp. salt, and remaining 1 Tbsp. pepper in a 9x13x2″ baking dish. Pour oil into a 10″–12″ heavy straight-sided skillet (not nonstick) to a depth of 3/4″. Heat over medium-high heat until thermometer registers 350°. You can try propping the thermometer in the pan, but I never have luck with that. I just keep it close and check the temperature of the oil frequently. Meanwhile, set a wire rack inside a large rimmed baking sheet. Working with 1 piece at a time (use 1 hand for wet ingredients and the other for dry ingredients), dip chicken in buttermilk mixture, allowing excess to drip back into bowl. Dredge in flour mixture; tap against bowl to shake off excess. Place up to 5 pieces of chicken in skillet. Fry, turning chicken with tongs every 1–2 minutes and adjusting heat to maintain a steady temperature of 300°–325°, until skin is deep golden brown and an instant-read thermometer inserted into thickest part of chicken registers 165°, about 10 minutes for wings and breasts and 12 minutes for thighs and legs. Using tongs, remove chicken from skillet, allowing excess oil to drip back into skillet; transfer chicken to prepared rack. Repeat with remaining chicken pieces; let cool for at least 10 minutes before serving. And voila, better than takeout any day! Oh, and don’t forget the Spicy Vinegar! Slice chiles into quarters, lengthwise and place with vinegar in resealable jar. Seal and shake. Let sit at room temperature for 1 week before using, shake daily. After that it will keep almost forever in the fridge. 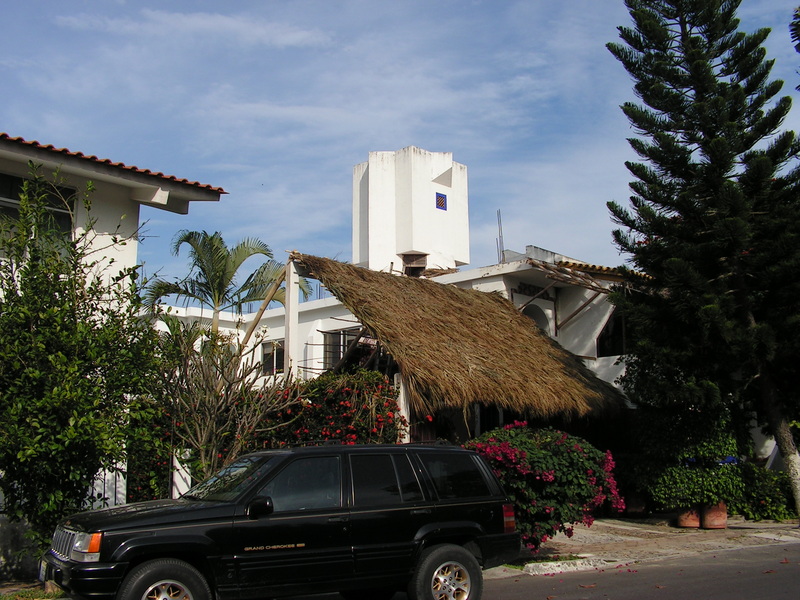 September 24, 2011 – It’s hot, very hot today at Casa Madera Bed & Breakfast in Nuevo Vallarta. 32 degrees with humidity so it feels like 39. You move, you sweat. It’s that simple. You cannot escape it unless you lock yourself in the house with your air conditioner on. We don’t use the air conditioning so we pay the price. Yes, the price. The average September day is a 3 shirt day. You wear one until it gets too heavy and you put on another. I had never had to stop typing to dry my keyboard in Alberta. Who knew that fingertips sweated! That’s just the way it is in late summer in Vallarta. While our friends in Northern Alberta are trying to protect their tomato’s from frost, we are just trying to stay dry. Heather and I spend a lot of time on our kitchen patio because of the breeze coming off the ocean or mountains but later in the day as the sun comes around it just is not the place to be. It is then we head downstairs to relax under the palapa. The Palapa. Who knew that a whole bunch of grass that was not cut into fairways or greens would be so inviting. But it is. It is shady and cool when the sun is beating down. It keeps the rain out when it is in torrential downpour mode. 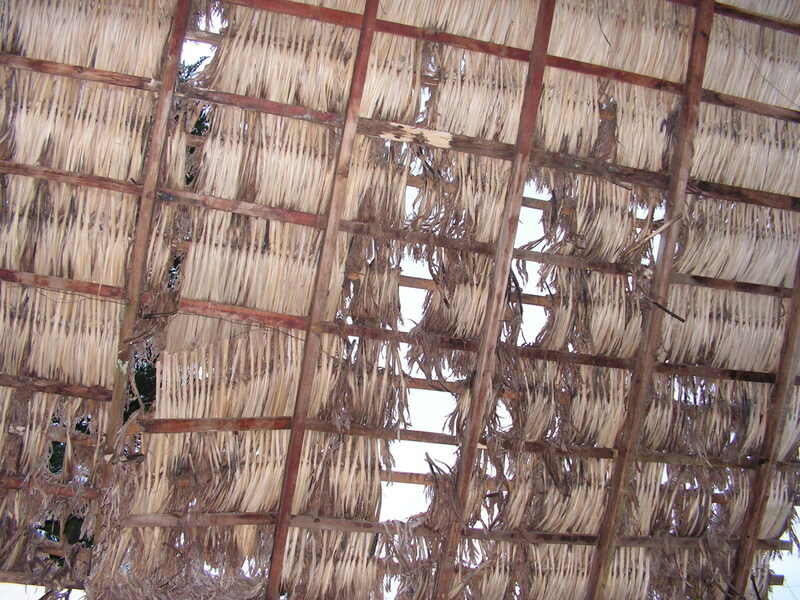 It is a natural roofing material whose price does not go up because maybe half the town needs a new one due to a hail storm like an asphalt shingle. 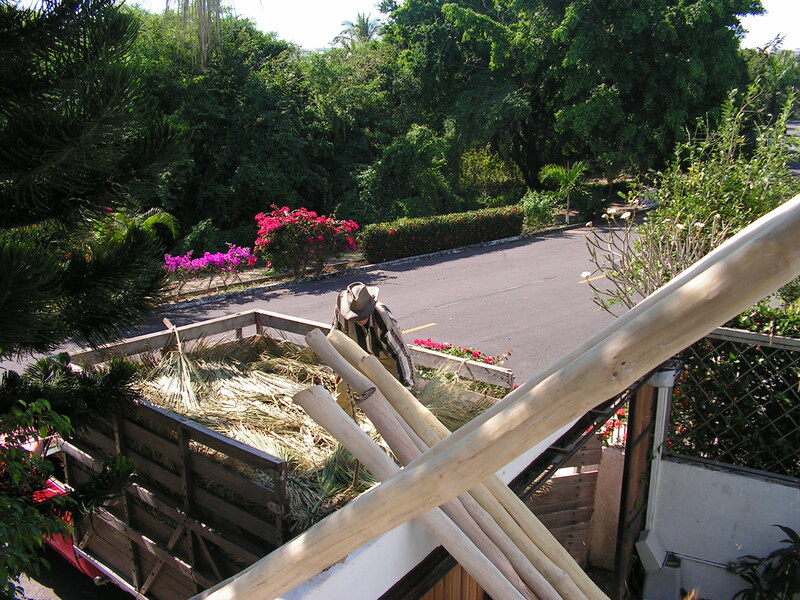 We have since found out that a Palapa is made from the dried palms that are used in churchs throughout the world on Palm Sunday. 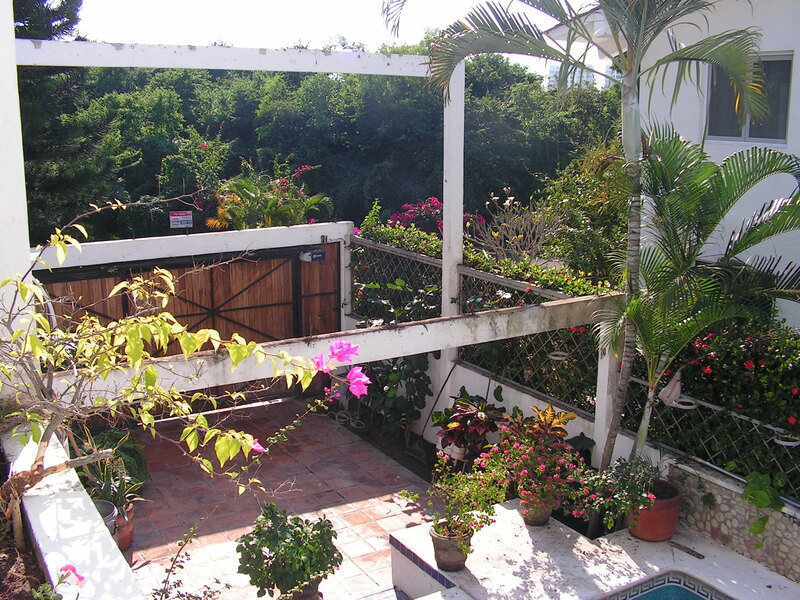 It’s beautiful and we think it is one of the most becoming features of our Bed and Breakfast. It is our favourite place to serve our guests breakfast. It was not always like that…. 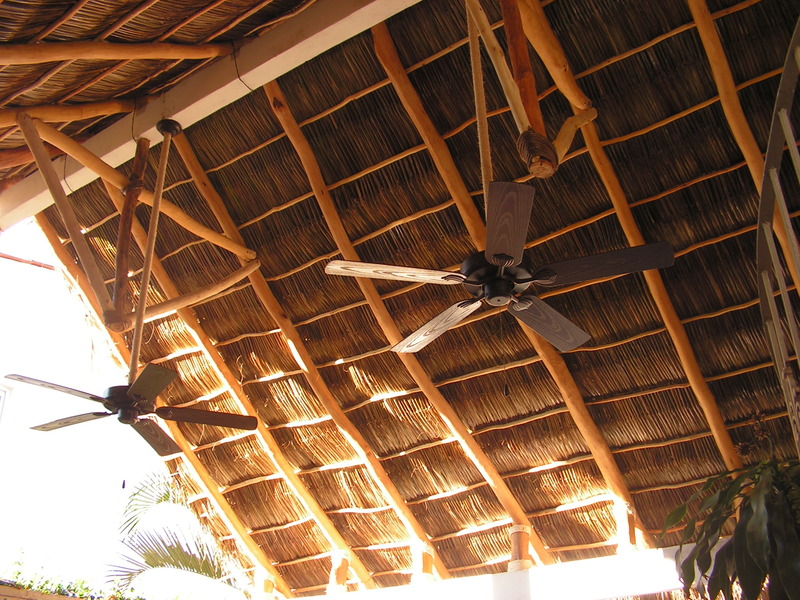 December 20, 2009 – Heather and I are sitting under the palapa enjoying a Corona while surveying the lower floor and deciding what we should do with what. It has been a long day what with doing insurance work in the morning and doing demolition in the back room in the afternoon. There was a small breeze coming off the ocean which was rattling the grass in the palapa and causing a great deal of it to fall on our heads! I don't think this will keep the rain out anymore! There was no denying the fact that the palapa had to be replaced. Now! It was falling down around us so we vowed the next day we would look into getting it replaced. Three company’s came out to quote on the job with 2 of them being the same price and one being way too high. The last man who came out to quote, Angel, walked into the area where the palapa was and you could tell that as far as he was concerned, he was going to rebuild this palapa. He looked at it and asked if we wanted dimension lumberor rustic. Same price either way. We said rustic. He said, give me $20,000.00 pesos and we will start tomorrow. We replied we will pay you the deposit when you arrive. Glad it's him and not me! Angel (pronounced Anhel) was the a typical Mexican cowboy. Long and lanky he weighed maybe 120 pounds if he was lucky. Looked to be about 60 but who knows. At 9:00 am the next day the truck pulled up and out jumped about 5 young guys who immediately started tearing down the old palapa. The grass was crumbling in their hands as they moved up the 2 x 4’s that were the trusses for the main support system. These guys had no fear, it was something to see. A good many of the 2 x 4’s were rotten after being exposed to the elements for a good many years. That day they removed everything and cleaned up the site. Angel came by to pick up the deposit and said he would be back in a day or two with the grass. 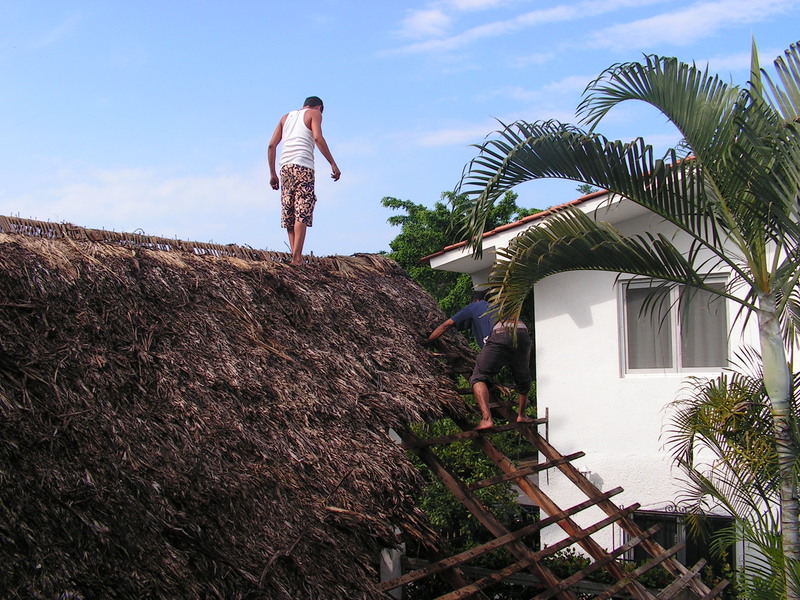 2 days later, a Sunday morning, Heather and I were up on the roof enjoying our coffee when a truck full of palapa grass pulled up in the driveway. For the next 45 minutes they dumped the grass on the patio along with some tree trunks which were obviously the rustic supports. The first truck load of grass with the support poles. We chatted a few minutes when they were done in Spanish and our take was they would be back in the morning to start. And back they were. They were preparing the trees for use. The tree bark had been removed but they needed to be ground and cleaned for use. So for two days we listened to the sound of the hand grinder going up and down these logs. 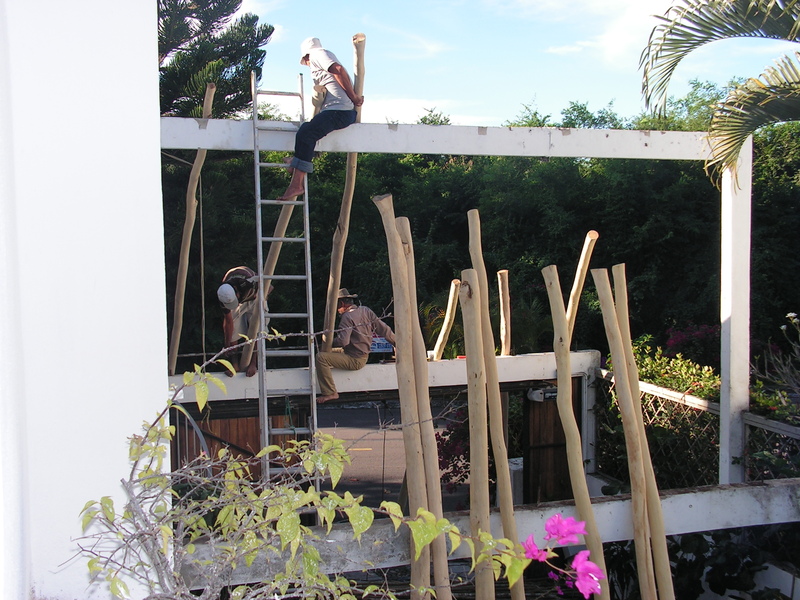 The next day the whole crew arrived and started to build the support system. It was fascinating to watch these skinny guys and the old man toss these logs around. Heather and I would be lucky if we could lift an end of one. They were tossing them around like they were toothpicks. Once the south side supports were up they started weaving the grass. It was amazing watching them do this. Taking a piece of grass and weaving it over the cross member. The worker would do a whole row and then go along with pruning shears clipping the edges to make sure they were even. It is like watching performance art, except it makes sense and you get a reliable product at the end. However, the work takes time. Something neither Heather or I ever realized. It took a lot longer to do than we ever imagined it would. 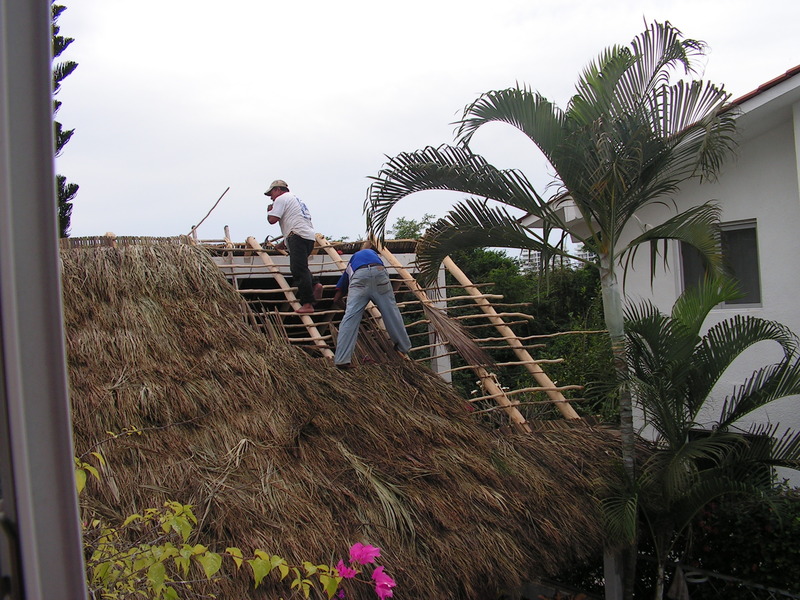 It was about 10 days into construction when Angel told us he had got a job to do a very large palapa for a hotel in Yelapa. A small village only accessible by boat from Puerto Vallarta. 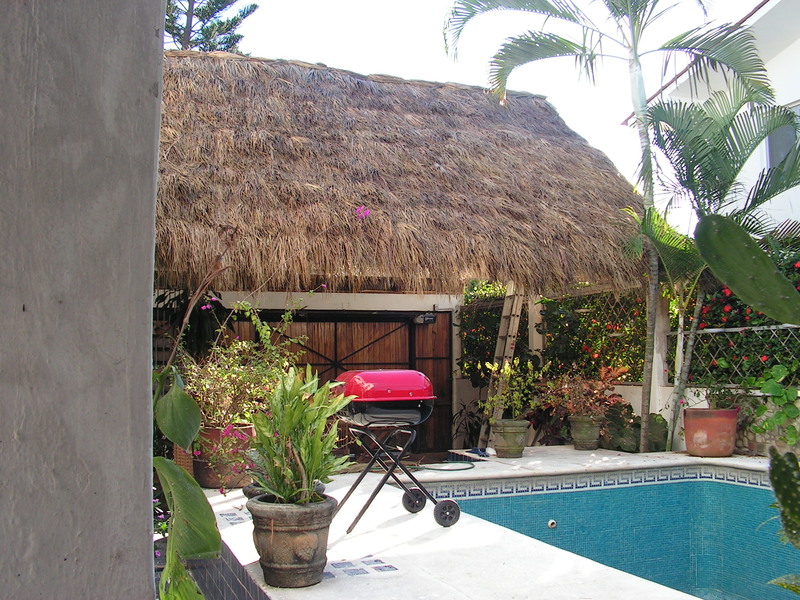 The size of the palapa escapes me now but we worked it out based on the amount of grass that he needed that it was worth $30,000.00 us dollars. Now that's a nice palapa! 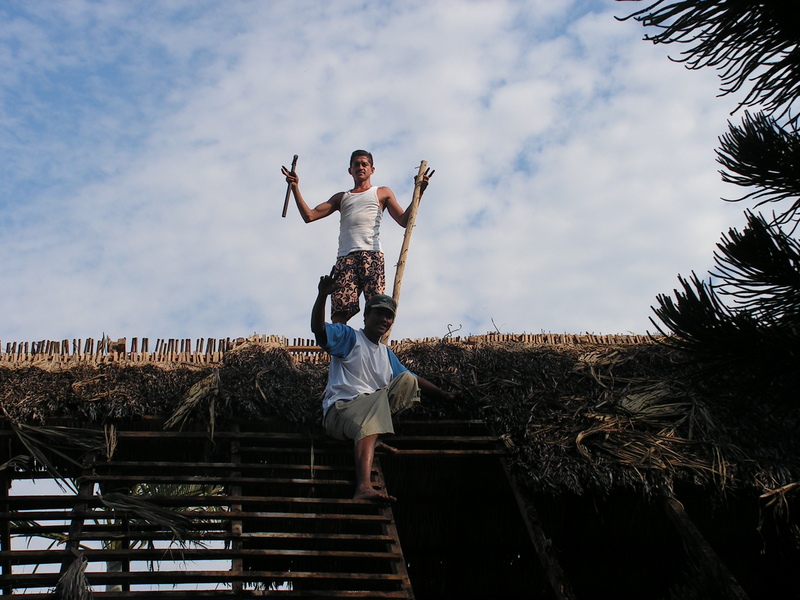 It took just over 3 weeks start to finish for our palapa to be completed. It is beautiful. It provides shade when you want it. It keeps out the rain so you can sit in comfort while it is pouring outside. And most importantly, it has fans installed that help keep you cool when its 35 degrees outside in the shade…. We have the fans now we just need the Corona!